The detailed nature of this book about the life and death of Eric Garner allows us to see, in horrible living color, exactly where we’re at in terms of race relations in the United States. Eric Garner died July 17, 2014 in Staten Island, victimized on this day by police who put him in a chokehold and ignored his pleas that he could not breathe. 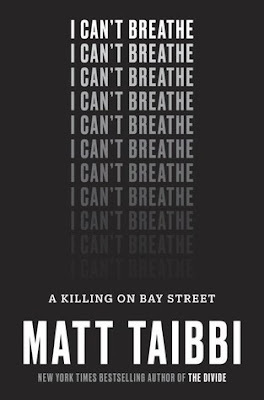 What Taibbi does exceptionally well in this difficult book is allow us to see Eric Garner for the man he was—a well-liked and respected member of his community. The entire story told here is a long and winding one, going back to pick up relevant cases along the way, including that of Carnell Russ of Alabama, whose death in 1971 by pistol shot at close range in a police station was challenged in court a number of times until finally we learn a monetary award was never paid to Carnell’s widow. Forty-five years later the original prosecutor in the Eric Garner trial, Dan Donovan, was elected to Congress, proud of his role in protecting the white people, in his eyes, unjustly under attack for upholding the law. So carefully has Taibbi prepared his case in the writing of this book that when we read the words “disrespect for the law, contempt for society, a refusal to abide by the responsibilities of a civilized people,” we briefly imagine the words were chosen to describe the men and women of the NYC police force who refused to give credence to citizen complaints about uncalled for police harassment and reckless endangerment. But no, this language was used by Joseph Concannon, retired NYPD captain and staunch defender of whatever the police did in the course of their duties, illegal or not. City politicians elected before, during, and after the prosecution of the Eric Garner case come off looking weak and ineffectual at best, deliberately obfuscating at worst. The case of the killing of Eric Garner came amidst a rash of police killings around the country that were well publicized, mostly due to actual video of the crimes. It is absolutely horrifying to imagine for a moment how these cases would have been treated in the absence of a video record. Even in these cases, obstruction into the behaviors of repeat offender police is rampant, common, and from the point of view of the citizenry, indefensible. The black lives examined in this work are extremely stressful. Putting ourselves in their place, we might even say these lives and conditions of life are hopeless. But Eric Garner did not see things that way, and certainly on the day he died, he was the happiest he’d been in a very long time, his son having just been awarded a sports scholarship for advanced education. Taibbi is able to make us feel the heat that day in July, and the satisfaction the big man would have felt. We’re plenty pleased, too. I have wondered, in thinking of Taibbi’s past work, what it would be like to to be on the other side of one of his scathing investigations. Now we know, because he co-authored a book during his expat days in Moscow, in which he targeted everyone in the outsized-profits-fueled economy, from foreigners gaming the system to Russian oligarchs and their deadly, beautiful hookers. Adolescent, ridiculous, and forgettable, excerpts I read from that earlier work should have meant a far longer, more circuitous path to legitimate journalism. The argument in the link above charges Taibbi with sexism and misogyny, a shadow of which, it could be argued, appeared in his description here of Assistant DA Anne Grady. It is my contention that Taibbi’s work uncovering the hows and whys of the life surrounding Eric Garner is a far weightier thing on the scales of right and wrong-doing than that earlier work. It is important we all scour our own past for sexism—doling it out or letting it pass—before nailing the coffin shut on the talent and real heart shown here. With this book, Taibbi blows past any criticisms that could be leveled for those earlier errors in judgment and gives us something terribly important: a honest, raw look at where we stand in our race relations right now. Perhaps only bad boys could understand, empathize with, and give us the nuance of all the imperfect characters Taibbi details for us here, and get to the depth in this story that explains Eric Garner’s life and untimely death. A lot has happened from then to now, but nothing that can’t be undone.